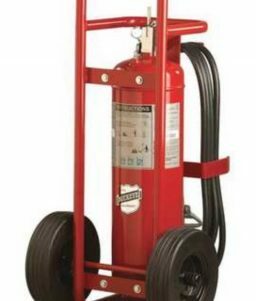 OnlineSafetyDepot.com carries Badger and Buckeye wheeled fire extinguishers for heavy-duty industrial use. 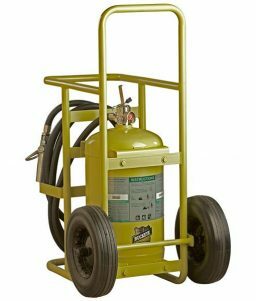 Perfect for commercial and industrial operations – ship docks, ships, refineries, construction sites, chemical plants, storage facilities, laboratories, and any other facilities where the need to transport a heavy-duty fire extinguisher is required. Wheeled Extinguishers provide the ability to easily and rapidly transport the heavy extinguisher (50-350lbs) from its storage position to the location of the fire, or to another location within the facility should it need to be moved. 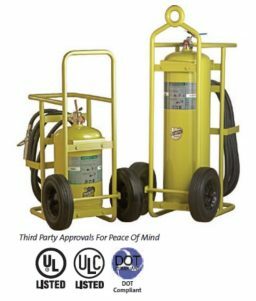 This ease of transport and maneuverability ensures it can be operated by a single person. This is important in that in many instances it will be a single person who initially responds to the emergency. 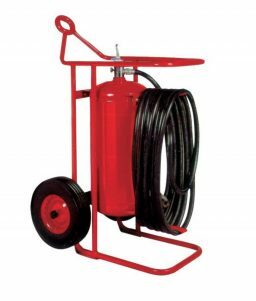 The Wheeled fire extinguishers come with a durable and functional 25 to 50-foot hose. 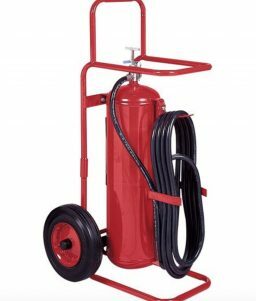 This extension of its reach is an essential feature when the fire is in a place where the extinguisher may not be able to be easily moved, e.g., upstairs, through a narrowed opening, etc. 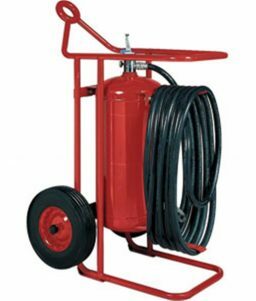 Its sturdy built frame with a broad base of support, ensures stability against tipping when the hose is being pulled or if objects including personnel bump into it. 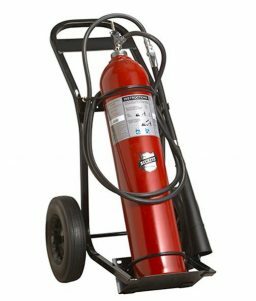 The Products we carry contain the highest percentage of essential base ingredients found in the fire extinguisher industry. 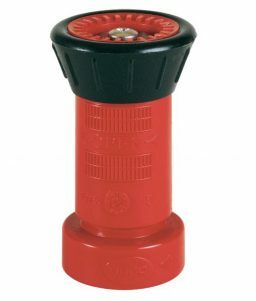 The “Multipurpose” agent models are suitable for use on Class A, B, and C fires. 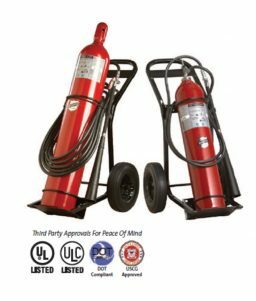 The “Regular” and “Purple K” agent models are suitable for Class B and C fires. 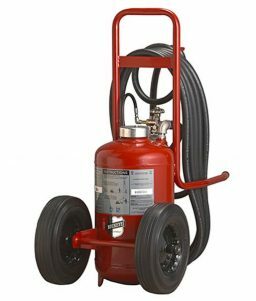 Our wheeled fire extinguishers meet UL, ULC, TC, and DOT requirements. 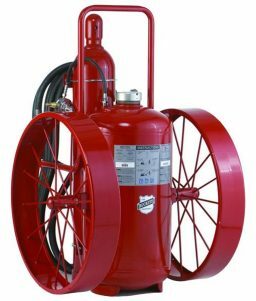 12 or 7-year periodic hydrostatic test interval per D.O.T. 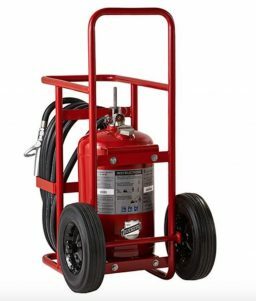 Want an overview of the wheeled Fire Extinguishers? 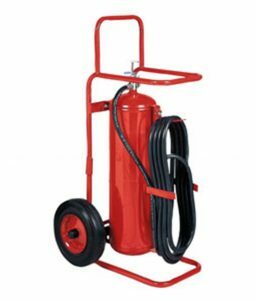 Not sure what type of Fire Extinguisher you need? Not sure what UL ratings are?